The venue for The Handlebar Club's 2014 AGM weekend from 4th to 6th April will be this 150 year old Victorian edifice infused with much charm and history, The Palace Hotel in Buxton, Derbyshire, SK17 6AG. 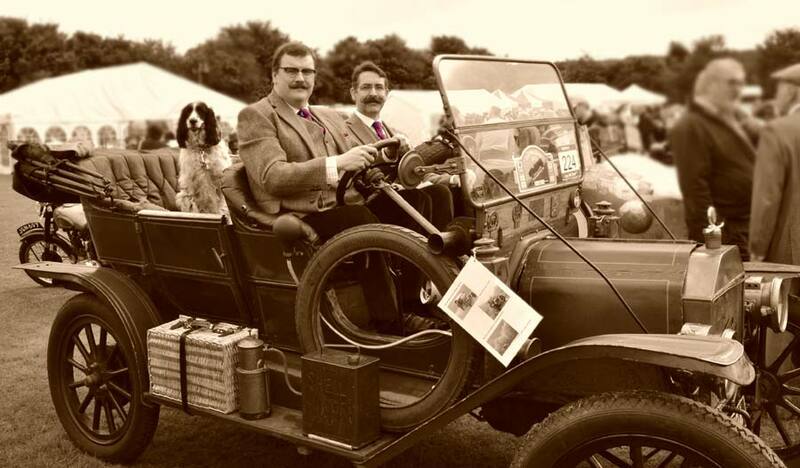 Members of The Handlebar Club usually cause a bit of a stir when out and about in public, and when tweed-clad Members Ryan Pike, Allan Robinson and Friend Bowser took a September day out in Buckinghamshire, it was no exception. “I and Allan Robinson went off to the Kop Hill Climb 2013 - an historic hill race near Princes Risborough, Bucks, in full club regalia, and had a splendid day fitting in with all the old vehicles. 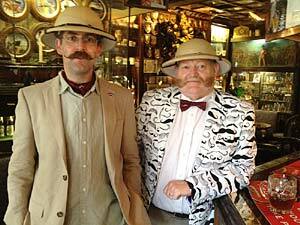 “In fact, we became a bit of an attraction ourselves due to our moustaches. I was time to wet our whiskers again! 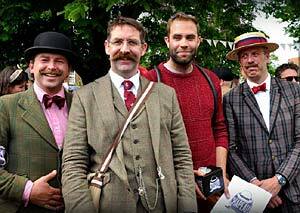 Members of The Handlebar Club and The British Beard Club joined up at the Great British Beer Festival on Hat Night Thursday again this summer. More pictures celebrating the evening to follow! Twin Handlebabies make their début! June is the ideal month for deliveries - of babies that is, and several of our members and their respective partners have been busy. 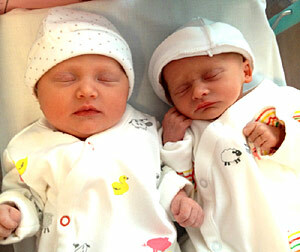 Twins Etta and Percy King (above), were born to Jemma and Johnny on 17th June. All four of them are doing well! First Friday (7th) in one of these! Can you resist the temptation to go for one of these fancy dress suits? Just the thing for the ‘tache about town! Atters? Johnny? Fingers? Only £59.95 with free delivery from OppoSuits. Clink the link below for more information. 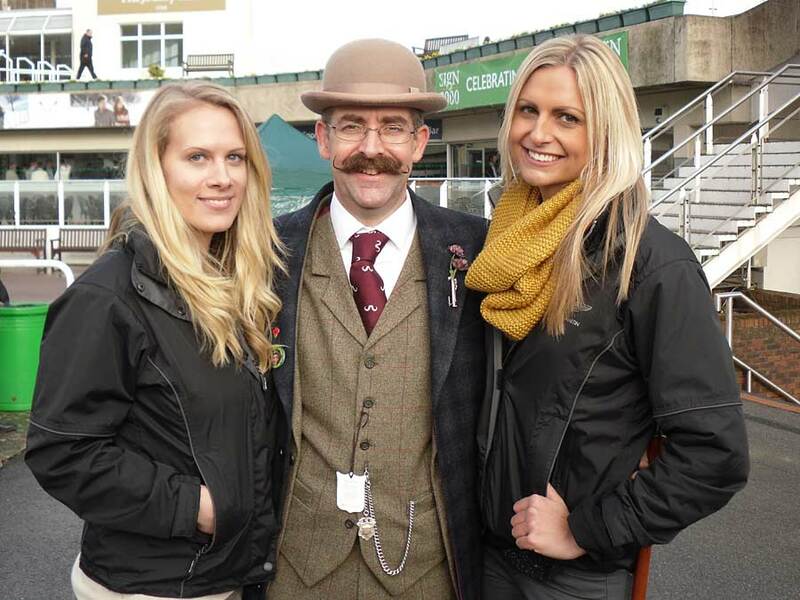 Pity they couldn't find a model with a Handlebar Moustache - should've asked us! 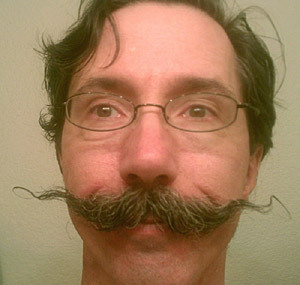 Longing for a Moustache like this? Take a Turkish Transplant 'n Shopping holiday! 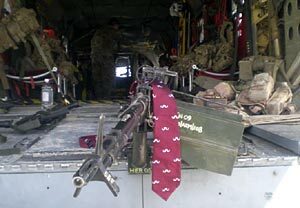 Mark Brown, a member of the Armed Forces as well as of The Handlebar Club, sends “Regards from Helmand” with this photo of his Handlebar Member's Club tie right ‘in action’. 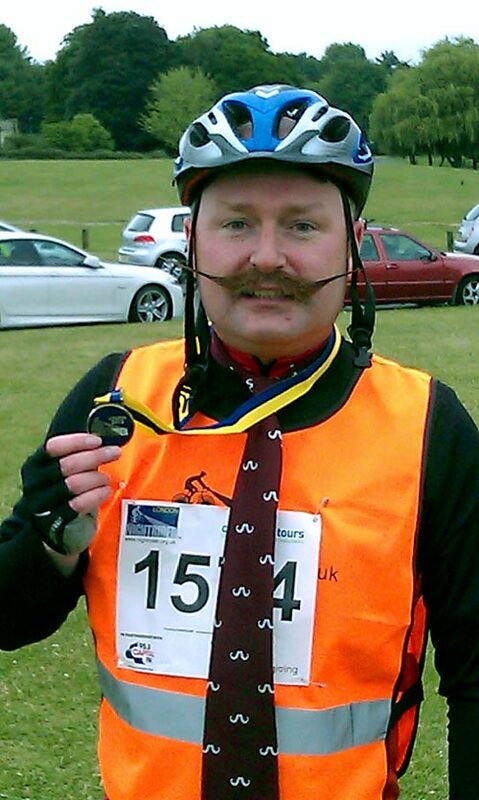 Mark wonders if this the first time a Handlebar Club tie has been to war? Remember AGM 2012 at Yelf's? Who are Jackson, Fred and Leo? 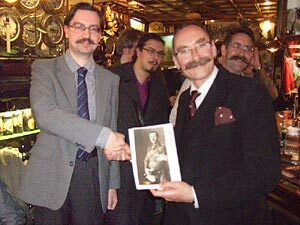 Who won the English Moustache British Championship title? In what event did Fingers and Conrad take to the saddle? 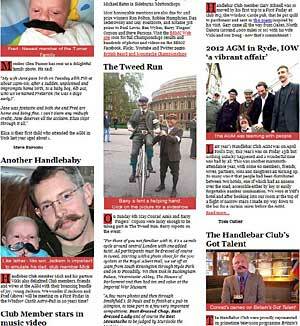 Read all about what we did in 2012 HERE. 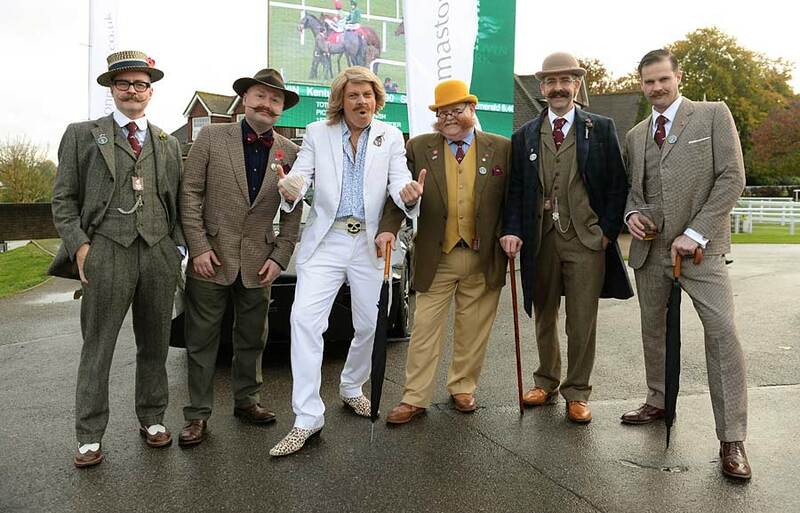 Gentlemen's Day at Sandown Park! 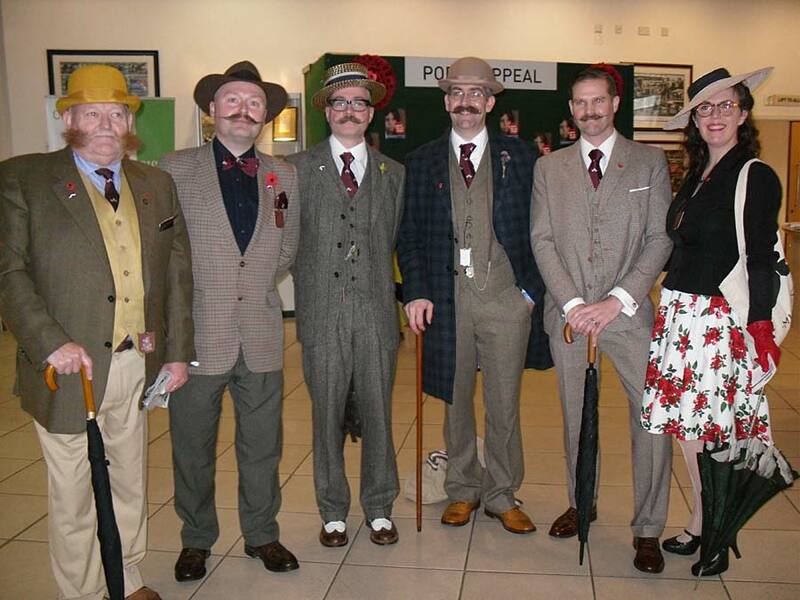 With the rain coming down and the conditions being soft underfoot the members of the Handlebar club started to assemble like the proverbial herd of cats at Sandown racecourse for Gentlemen's Day in support of Movember. All being impeccably turned out, the team caused quite a stir and were immediately signed up for the 2.00pm Best Dressed Gentleman award... So until then it was into the venue to sample the fine ale on tap from The Hog's Back Brewery, devour tasty salt beef sandwiches and study the form. Bets were placed, shirts were lost and no fortunes were made... well - if anybody did they didn't let on! 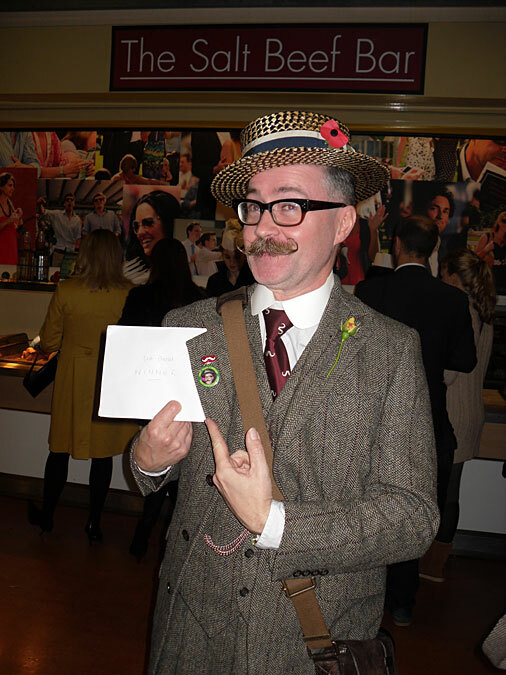 1st Place Winner of Best Dressed Gentleman, our own Fingers Copson! as he forfeits his new car! On a high, the team turned their attention back to the racing and beer. The racing was close and exciting, if a little off-the-pace due to the soggy conditions and a fine time was had by all. 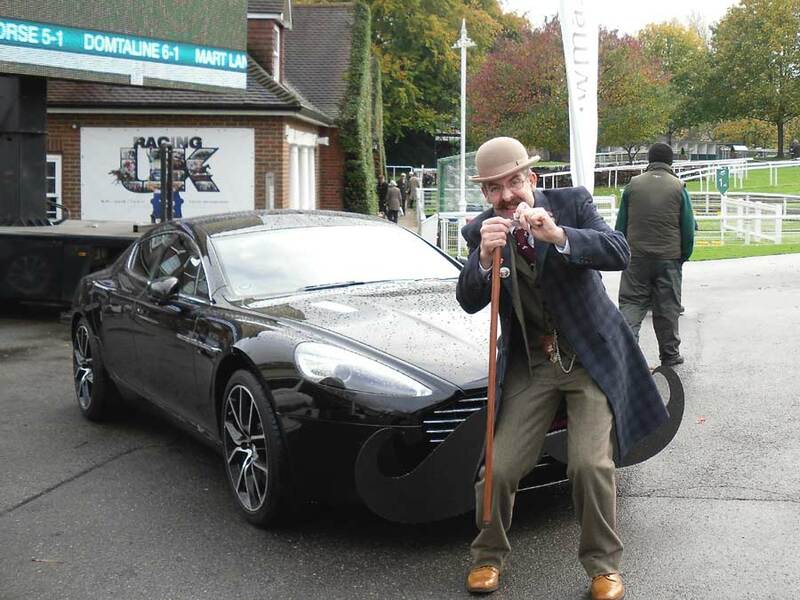 Here's the official photo and release highlight by Sandown Racecourse. Click the link below to download and read their accompanying PDF press release. “Malik Afridi is a Pakistani businessman who extremists have tried to kill - all because of his eye-catching facial hair. “So why is he prepared to risk everything for his extraordinary moustache? Another Very Special Baby Arrives! 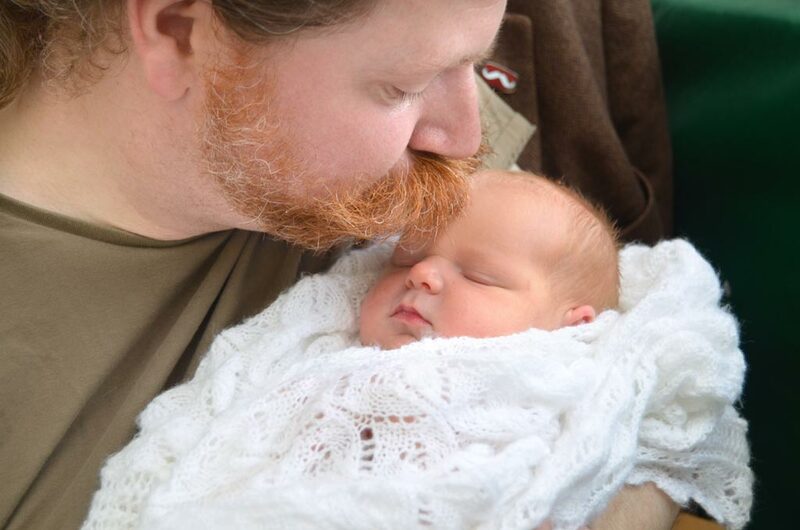 A birth is always special, and Wynnifred Violet Lewis arrived at 10.05am on Wednesday, June 26 2013, weighing 7lbs, to Sarah and Paul Lewis. All of them are doing well too! Sarah assures us that Paul is sporting muttonchops here and not - never, a beard. Allan Robinson at the 3rd Velo Vintage occasion & ride in Exmouth on 15 June 2013. 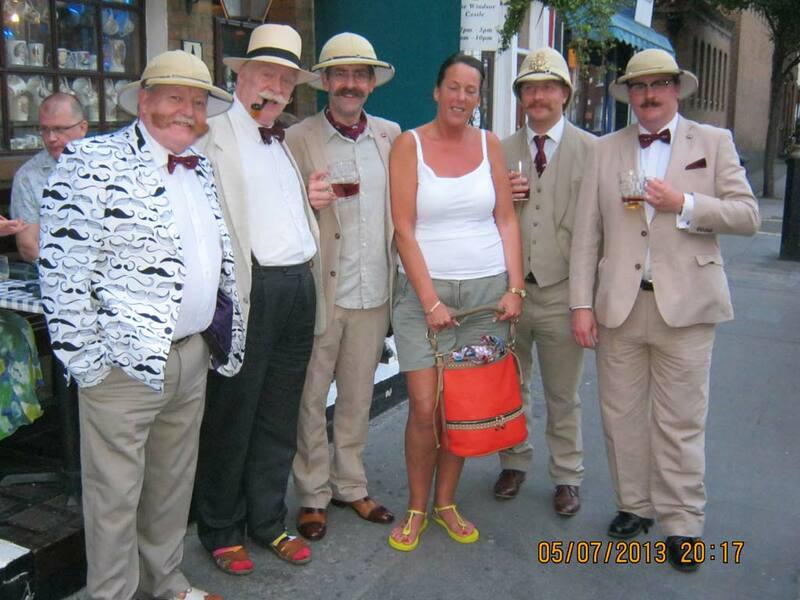 Allan Robinson reports on his Vintage Velocipedal Occasion around Exmouth, East Devon in June, sporting his maroon Handlebar Club Tie throughout. “This was a wonderful event organised by Alistair and Sebastian Cope. Starting in the strand we set off at a leisurely pace along the sea front, back through the town and then followed the estuary cycle path to our first stop at The Swan for a much needed ale and some smashing cheddar and pork pies supplied by the generous hosts. “Once refreshed we struck out to tackle the climb up to the National Trust's A La Ronde for fortifying cream teas and an admiration of the surrounding views. 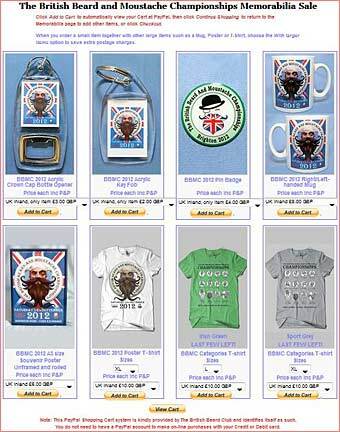 The BBMC 2012 On-line Memorabilia Shop is open! At last you can get hold of some permanent reminders of that marvellous and memorable day of follicular fun at The British Beard and Moustache Championships on September 15th 2012 in Brighton, Sussex, UK. Memorabilia items feature the brilliant BBMC 2012 poster design or the BBMC 2012 logo, and include the illustrated Acrylic and Metal Bottle Opener/Key Ring, the Acrylic Key Fob and Ring, the BBMC 2012 Pin Badge, the A3 Souvenir Poster in full colour on quality paper and the 'Poster' design White T-Shirt. Prices including postage are shown with each item. Choose your postage destination and T-shirt size before you 'Add to Cart'. The PayPal Shopping Cart system is easy and convenient to use, and you do not need to have a PayPal account to make on-line purchases with your Credit or Debit card. You can order small items together with other large items such as a Mug, Poster or T-Shirt, and save on postage charges by choosing the 'With larger items' option. Eric is a master of Moustache Styling with Unfamilar Substances - notably glue stick and other agglomerations. You'll have to look at some of his Forum posts to find out how to visit his busy Blog! 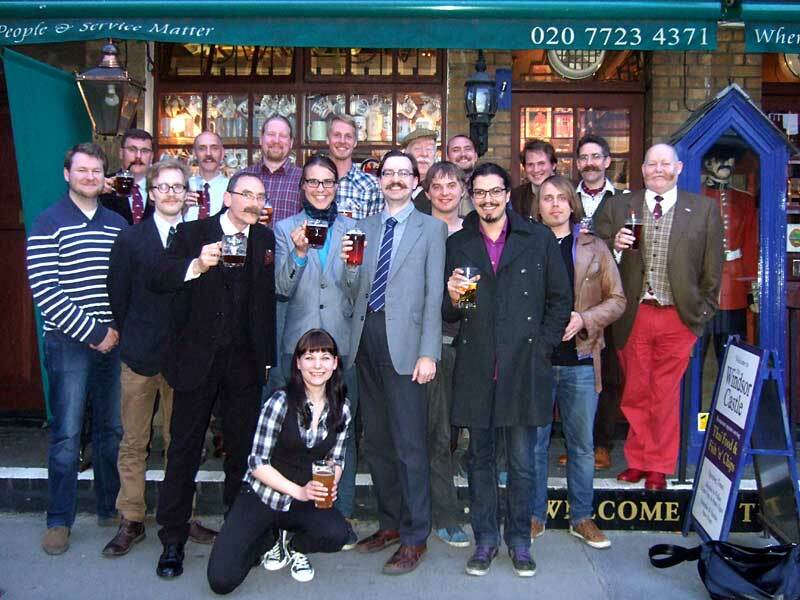 The Handlebar Club are proud to continue our longstanding whiskery support for the excellent charity Movember, which as you may know is responsible for the multitude of fine moustaches now appearing around the world. Growing their “Mo’s” across the whole of November, men raise vital funds and awareness for prostate and testicular cancer and mental health, globally raising over £92 million in 2012. Anyway, if you haven�t signed up to this fine cause yet, head to uk.movember.com and get ready to Mo. Good luck! 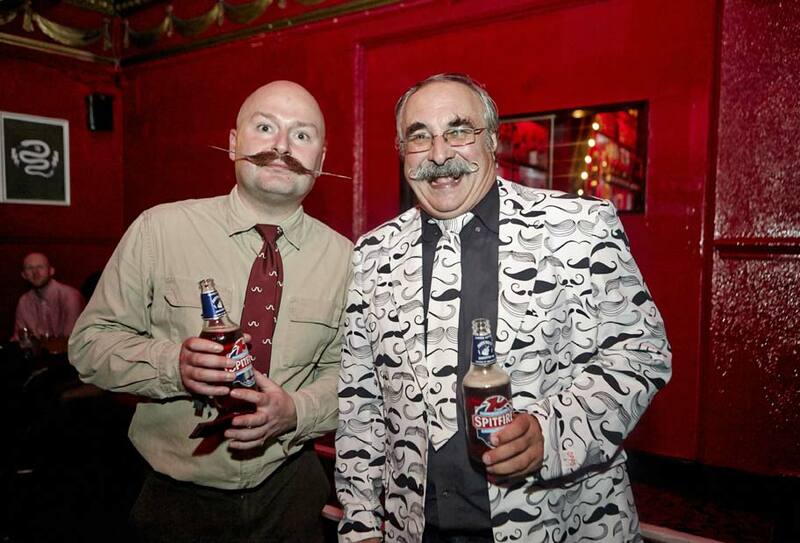 Handlebar Club President Rod Littlewood and (strangely intense) member Conrad Amis attended the official launch of Movember recently at Coco on Camden High Street, London. 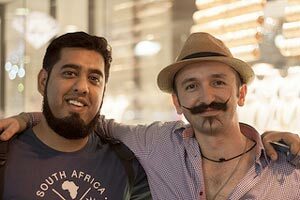 Old acquaintances were renewed and a fine time was had by all as the Movember team briefed everyone on the plan to better the amazing results of last year's worthwhile campaign for men's health. and Alan Spencer wears THAT jacket! 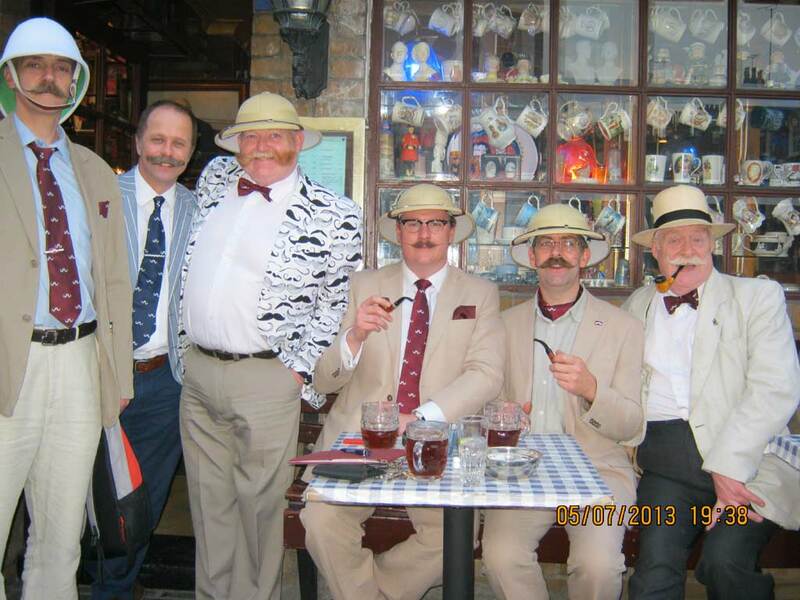 Sartorial splendour was the order of the day at the July First Friday meet at The Windsor Castle, Crawford Place, London. Having thrown out the Opposuits challenge in column 1 a month or so ago, Alan Spencer from Southamption, already famous for his wonderful waistcoats, was the one not to be outdone, and donned the Opposuits jacket for our amazement. We have one more photo to show you from that July First Friday. If you walk up the Edgeware Road from Marble Arch to Crawford Place, you can't fail to notice the lines of distinguished gentlemen indulging in an aromatic and peaceful pastime. Here are two more-familar faces doing just that. 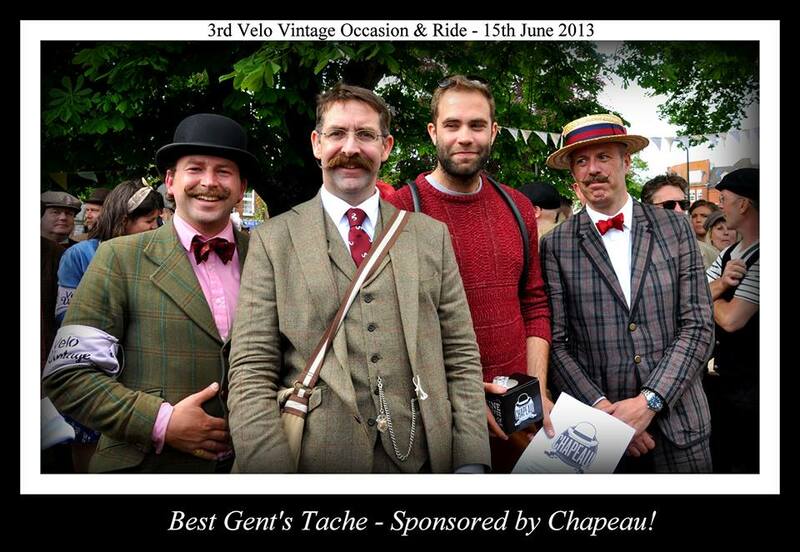 Handlebar Club member Conrad Amis recently participated in the annual �Nightrider� London charity cycle ride. The route covered 100km around London (that�s 63 miles in old money) and took in parts of the capital from Crystal Palace to Alexandra Palace and Swiss Cottage to Greenwich. It also included Spaniard�s Road at the top of Hampstead Heath, which our man claims to be the highest point between the Urals and the Rockies. The elite team of cyclists, led by colleague Fat Jolly Chris, would like to thank everyone, including the Handlebar Club itself, for all of the kind sponsorship and are proud to have raised over £600 for The National Autistic Society. 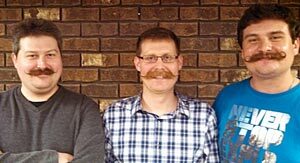 The Theriault Brothers, Aaron, Bryan and Mark are on their way from from Grand Rapids, Michigan in the United States to London, triumphantly moustached and eminently graspable. They are keen to join The Handlebar Club during their three-day visit to London and look forward to meeting some Club members while they are over here. “We will be vacationing in London on Tuesday 28th, Wednesday 29th and Thursday 30th of this month. 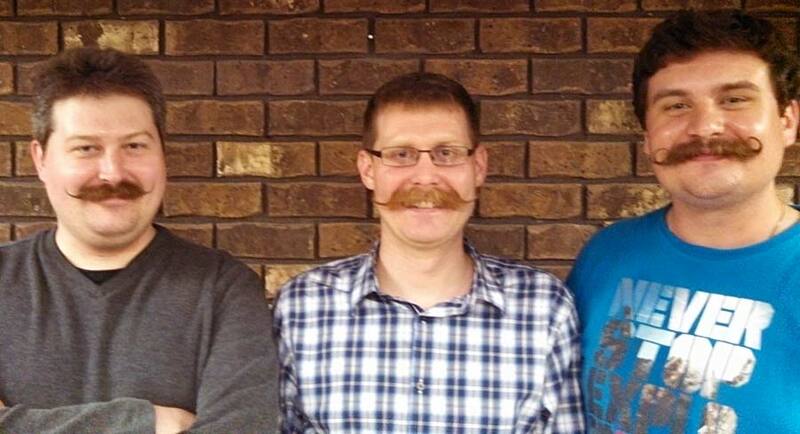 We have met the requirements to attain ‘an hirsute appendage of the upper lip with graspable extremities’. 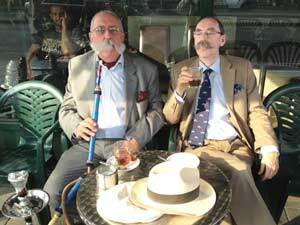 If you would like to meet them at The Windsor Castle and welcome the boys to the delights of Membership of The Handlebar Club on one of three days they're in town next week, please get in contact soon with the Theriault Brothers through Mark's Facebook page. We all raise our glasses and say “Kippis!” to our new Finnish friends! On Friday 10 May a group of impossibly young-looking 4th-year history undergraduates from Helsinki University joined regulars at the Windsor Castle pub in Paddington for a special Meet-the-Finns session. They were all members of the History department�s student moustache club, whose leader Alex presented the Handlebar Club with a delightful historic photograph of Baron Carl Gustaf Mannerheim, the moustachioed sometime Marshal and President of Finland in full regalia (the Marshal was in the regalia, not Alex). Several regulars were in attendance and the committee was represented by our own Alex and Tom Cutler � the Despicable Parsons still had his nose to the grindstone. Sandwiches were rolled out and Tom was able to explain to the visitors what exactly is inside a mini Scotch egg. They didn�t believe him. The evening culminated in a rousing rendition - on the street - of Rule Britannia, bellowed out by the Finns in impeccable English. Then we spent the usual 20 minutes trying to get a picture taken (see above - click to enlarge). What a charming bunch of young chaps, and a lovely young lady too.